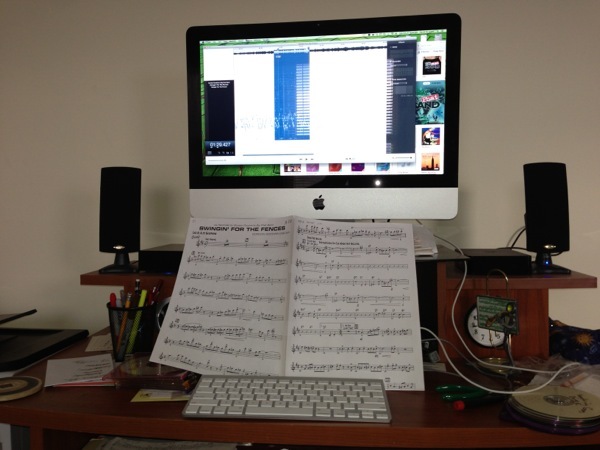 Using my iPad and wireless keyboard as a stand while I shed some flute parts on Gordon Goodwin tunes for tonight, using Capo to slow things down a bit. Today was indeed a red letter date for me. I completed a practice goal that I had set for myself over a year ago. That goal was to complete an intensive study in clarinet technique. It began I believe 2/19/2010, and ended today 4/8/2011. Over 140 hours of practice, on a very regimented schedule. I had completed a very similar process on the saxophone during my college years. So similar in fact, both the saxophone and clarinet technique books have Jack Snavely in common.